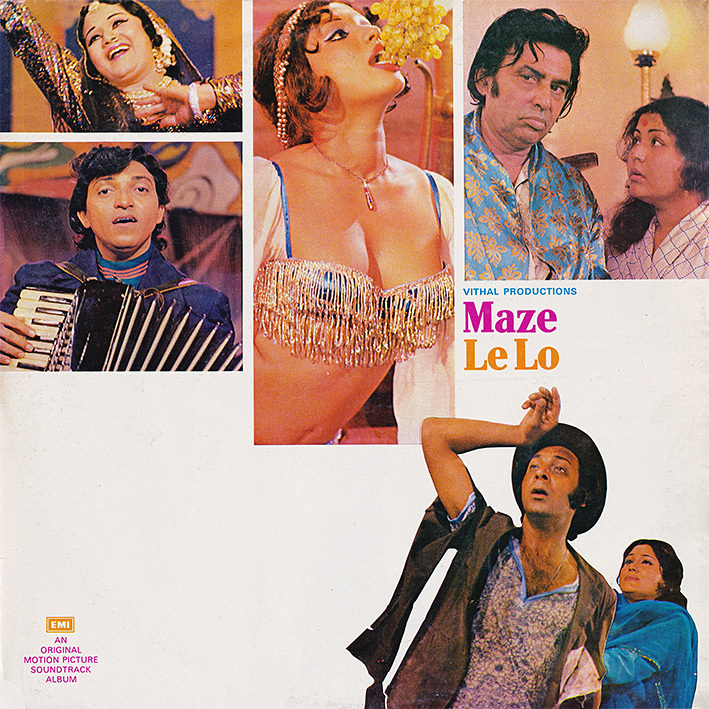 'Maze Le Lo' is a strange one. There's aren't many mentions of the film online*, and its soundtrack – curiously also released in France – was made by people that are all unknown to me. Half of it is composed and performed by Mahesh Naresh, a duo comprising Gujarati brothers Mahesh Kumar Kanodia and Naresh Kumar Kanodia. 'Baankelal Ne Apne Ghar' and 'Aksar Koi Kadka' are both bizarre mashups of all sorts of musical styles combined with dialogue and snippets of other, more famous Bollywood songs. I have no idea what's going on in either but the YouTube clip labels the latter (which I prefer) a parody song. 'Mere Aangana Men' is more coherent; very percussive but interspersed with some cool organ bits. Mahesh Naresh seemed to be under the influence of RD Burman, just not as good. Shakila Bano Bhopali is credited with composing the more traditional sounding 'Too Na Samjhe' and 'Aaj Ki Taza Khabar', as well as supplying vocals. From what I gather she used to be a famous singer of qawwalis. Most surprising of all is 'Love Me Love Me Tonight', written by Goan jazz musician Chris Perry and performed by a singer named Fernando. It's a fuzzed-out garage-punk track that wouldn't have sounded out of place in a 1960s biker movie. *A rather sleazy looking film with the same title is available in its entirety on YouTube, but I think that's a different one. Thanks PC. What a freakishly weird soundtrack! Thanks for this ... the track by Shakila Bano Bhopali is also a "cover" of the song "Aaj ki taza khabar" from Son of India. So not a whole lot of original stuff in this soundtrack. The Love Me Tonight track is pretty wild though ... shame that it is so short! The first song is a parody type song where the dialogue before the singing says something like multiple play-back singers are invited to a party and they are told that they need to only converse through song. Then of course you have the snippets of the singer imitating the famous playback singers. This is an oddity for sure!